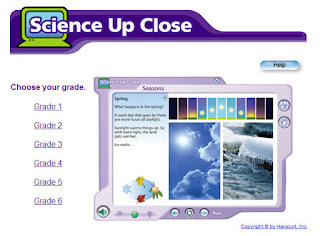 Harcourt's Science Up Close is a collection of mini lessons that you can use on your Smartboard or Interactive Whiteboard to help your students understand science concepts. The activities are made to accompany the Harcourt Science texts, but even if you don't use the Harcourt texts, you will find activities that you can use with your science lessons. Each lesson has clear audio and images, animations, or video clips to demonstrate and explain each concept. Many lessons are also interactive and will encourage your students to explore the content. Grade 1: A Coral Reef- Learn about living things that are sheltered in coral reefs. Grade 2: What Happens During the Water Cycle- Learn about the movement of water in the water cycle. Grade 3: Shadows Throughout the Day- Explore the effect of the sun's position on the length of a shadow. Grade 4: Full Moon to New Moon- Discover why the moon changes phases. Grade 5: Features of the Ocean Floor- Uncover features of the ocean floor. Grade 6: World Biomes- Explore forest, grassland, desert, and tundra biomes.